I’ve always been an Audi fan. 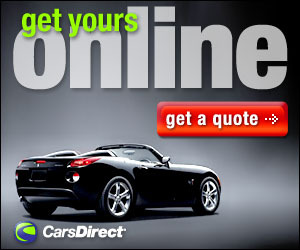 The German VW owned brand has always offered nice sedans and SUVs that are functional, practical and fun to drive. To me however—while good– they’ve always seemed a little too utilitarian, a bit bland; somewhat muted. Good thing I have a mind that’s open to change. Audi delivered me a new 2017 Q7 this past week. After a year away It’s all new for 2017 getting its biggest redesign since its debut in 2007. What they ended up with took all my utilitarian, bland, muted thoughts I had about an Audi and threw them out the window. This new Q7 is lighter; has a new chassis and perhaps most importantly, new styling. The interior is roomier and can be packed with all the latest tech gadgets Audi has to offer. 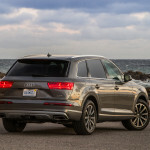 The Q7 is a full-size seven-passenger SUV with three levels: Premium, Premium Plus and Prestige. The Premium comes nicely equipped with LED headlights and running lights; automatic wipers, roof rails, panoramic sunroof, power liftgate, forward collision warning with pedestrian detection and automatic braking, and front and rear parking sensors. Inside there’s three-zone automatic climate control, leather upholstery, eight-way power-adjustable and heated front seats, selectable drive modes, a 7-inch color driver information display, along with Bluetooth, 10-speaker sound system with a CD player, HD and satellite radio. You can add a nav system, a 4G LTE Wi-Fi hotspot, a handwriting recognition controller pad and voice control. The navigation system is standard on the Premium Plus along with keyless ignition, hands free liftgate a power-adjustable steering wheel and blind spot monitoring. You can option in the Vision Package with LED headlights, a configurable gauge-cluster display and a surround-view camera system as well as the Warm Weather package with ventilated front seats, manual rear window sunshades, and four-zone automatic climate control. The top of the line Prestige has all the options of the Premium Plus and adds 20-inch wheels, a heads-up display, a 19-speaker Bose surround-sound audio system and a high-resolution 8.3-inch central display. Options available on all levels include the Cold Weather package with a heated steering wheel and rear seats), a tow hitch and a rear-seat entertainment system. While the Premium Plus and Prestige trim can get the Driver Assistance package with automatic high beams traffic sign recognition, lane departure intervention, and adaptive cruise control. The Prestige can get the Luxury package with such niceties as massaging front seats, upgraded leather upholstery, and power door closers. There’s also the Adaptive Chassis package with all-wheel steering, adaptive air suspension, a night-vision camera and a 23-speaker Bang & Olufsen audio system. 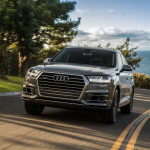 With all that tech, the Q7 can use all the info from the sensors and cameras to not only maintain distance from the vehicle in front at speed, but keep the Q7 in its lane, and even slowing automatically based on speed limit signs and when entering turns. My tester for the week was the Prestige that included the adaptive air suspension. 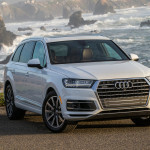 The new stylish lines of the exterior are carried over to the interior making the overall look of the Q7 a lot less like a box and more like the chic new SUV it is. Some of the other seven passenger SUVs I’ve tested were large, ungainly and looked more like a covered truck on wheels. The Q7 bucks this trend, looking almost too stylish to be the big seven passenger hauler it is. That carries over to the road as well. 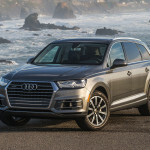 The Q7 drives more like a sedan than a seven passenger SUV. There’s very little of the outside world that seeps in, and all the controls are easy to reach; the handwriting recognition controller pad provides an extra measure of safety while driving. Once you get used to it, controlling all the features can be done with your eyes still planted on the road ahead. 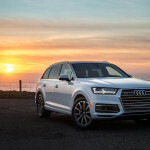 The adaptive air suspension keeps the Q7 glued to the road and combined with the excellent view, gives a great deal of confidence for a driver. 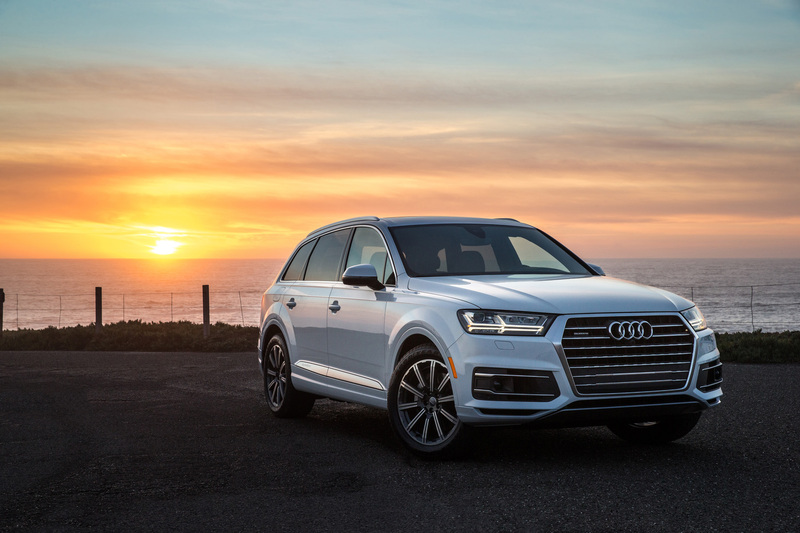 Of all the large passenger SUVs I’ve tested recently, the Audi Q7 is less like an SUV. And that’s a very good thing. 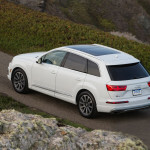 The new Q7 is stylish, functional, drives great and is far from bland. It’s changed my mind about what a seven passenger SUV should be. And it could change yours as well.